Painless Dentistry? Yes, it is possible. So why do some people expect that their routine dental treatment will involve discomfort or pain? 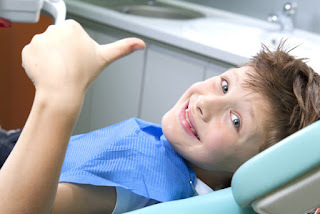 It may be that they are recalling an unpleasant dental experience from their past or their childhood. Or perhaps their dentist is not using all the tools our profession has developed over the past few years to improve comfort and reduce pain and anxiety. Fact is, very few things we do nowadays are painful at all, and even the dental injection itself (the dreaded "needle") has evolved to the point where many patients, after receiving their injection, have a hard time believing they'd had one at all. The most important ingredient in anxiety-free dentistry is communication. We dentists always need to keep our patients in the loop, and describe what we are doing in great detail, so we can be sure our patients know that we take their comfort very seriously. Some patients (unfortunately) want to avoid "bothering" the dentist with complaints, and will suffer their discomfort quietly. Don't. When you give us the information we need to keep you comfortable, you're doing us both a big favor. I don't want there to be any surprises during your visit, exept that it was better than you expected!